2013 Samsara, Syrah, Turner Vineyard, Sta. Rita Hills. The latest set of Chad Melville’s Samsara wines are truly glorious, including a great lineup of Pinot Noirs, Grenache and especially the Syrahs, including the five barrel single vineyard Turner Vineyard, which I just tasted at Samsara’s tasting room in Los Olivos on a short visit to Santa Barbara. Turner is set on local botella clay in the cooler northern part of the Sta. Rita Hills that helps make this Syrah taste like a northern Rhone wine with all the same complexity and character you’d find in a Saint-Joseph by Clape or Perret. Melville went for 50% whole cluster in this 2013 Samsara Turner and native yeast fermentation which adds up to stylish spiciness, pure aromatics and lovely expressive fruit, it was raised for 24 months in neutral, well used French barrels, and an additional year in bottle, unfined and unfiltered, which has allowed the tannins integrate is a wonderfully positive fashion. The 2013 vintage is really turning out to be a spectacular year for the Santa Barbara and Sta. Rita Hills after first looking a bit tough and edgy, a bit of time has proved a huge benefit for these wines allowing body/texture and fruit to come into focus and gain detail, this really is showing here in Samsara’s Turner Syrah with gorgeous mouth feel adding to the intensity of this wine. 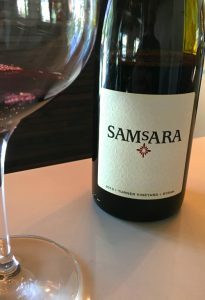 The nose is classic cool climate Syrah in this 2013 Samsara Turner Vineyard Syrah with black olives, fresh peppercorns, violets and black/blue fruits leading the way to a vital and vigorous palate of blackberry, boysenberry, damson plum and blueberry fruits along with a hint of creme de cassis, tapenade, meaty/bacon, camphor/embers, peppery sticky lavender and dusty earth in a very dark, black/purple with electric garnet edges, hued wine. Nice lift and pop highlight the freshness here, it’s structure is taught, though refining in a bold and forceful way, this Syrah is certainly evolving and unwinding, but still compelling, riveting and racy. This is just thrilling stuff, the excitement grows with every sip, it should age wonderfully as well, drink over the next decade!